Just what is everyday functional fitness? It’s a term that is bandied around the gym but what exactly does it mean? Well, functional fitness is about preparing you and your body for life. It is the opposite of specific training for a race, a competition or a weight lifting event. Think about bending to pick up a bag or reaching for something on a shelf or carrying an unwieldy and heavy object to your car. 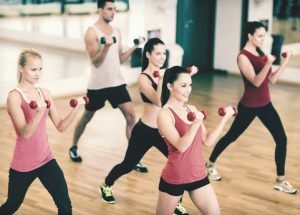 It is the type of exercise that engages multiple muscle groups while making everyday movements. The thing about everyday functional fitness is that it is nothing new and you probably do functional fitness activities every day, but by including some functional fitness in your workout, you will KNOW you are improving your body’s ability to cope with all that life throws at it. For the most part, functional fitness training concentrates on working on combinations of muscle groups. Lunges, step-ups, kettle bell swings, any movement that calls for strength, balance, coordination and flexibility will help your muscles deal better with any physical challenge that comes your way. It is also about multi-directional movement, so anything that gets your muscles working in a variety of directions will increase your strength, balance and flexibility. A lot of functional fitness focuses on using bodyweight but you can also use some additional equipment. Ropes, dumbbells, kettlebells and medicine balls will all help add variety and challenge to your workout. There are many, many exercise you can do either at the gym or at home to improve your functional fitness. Do ask the gym instructors in the Outlooks Gym for advice. In the meantime, here are some exercises you can add into your routine. (With thanks to Women’s Health Magazine (June 2018) for the exercises. Stand tall with feet more than shoulder-width apart; hold head of dumbbell with both hands at chest height. Sit hips back and bend right knee to lower to right until thigh is nearly parallel to floor, keeping spine neutral. Push through right hip to return to start. That’s one rep. Do six, switch sides and repeat, then rest 15 seconds. Stand on right leg and bend knee to load weight into hip; bring both arms to right side. Using arms and hips for power, jump as high and as far to the left as possible, landing softly on left foot. Quickly jump back to start and hold for two seconds. That’s one rep. Reset and do four or five, then switch sides and repeat; rest 90 seconds. Stand sideways near a wall, holding a medicine ball, feet shoulder-width apart. Brace core and rotate arms, torso, and hips away from wall, then explosively rotate toward wall and throw ball into it. Catch, pause, and reset at start. That’s one rep. Do five or six, then immediately switch sides and repeat; rest 90 seconds. Lie on left side with forearm on floor, elbow under shoulder, and feet stacked together. Bring right hand to left shoulder, then push down into forearm and raise hips to form a straight line from head to heels. Hold for up to 45 seconds, then immediately switch sides and repeat; rest for 60 seconds.